Feature loaded including nappa leather upholstery, ventilated seats, 8-inch touchscreen, dual-zone climate control, etc. 5 star safety with high-strength steel body frame and 9 airbags, ABS with EBD, traction control, etc. Have a question on Alturas G4? The luxury SUV segment has always been the forte of Japanese and American carmakers. 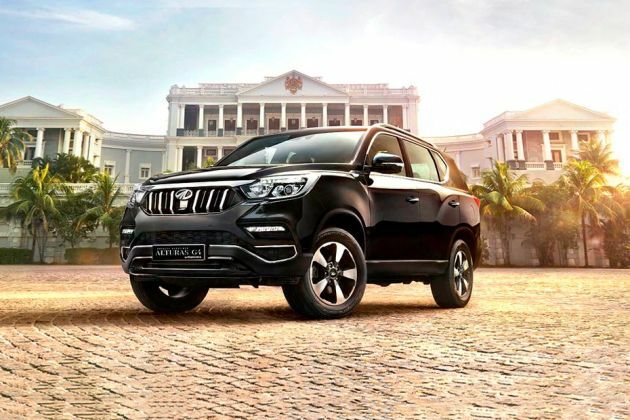 But now Mahindra & Mahindra, the indomitable player in the SUV segment in India has now rolled out its flagship luxury SUV in the form of Alturas G4. This is really an audacious approach since many carmakers have failed to make a mark in this segment and many cars are struggling for their existence. Products of Mahindra such as Scorpio and XUV500 have done a wonderful job in cementing the position of the company in the market. And now with the new Alturas G4, the carmaker looks forward to move up the ladder. The SUV has been on sale for many years in the international markets with different moniker SsangYong Rexton G4. It was first unveiled at the 2018 Auto Expo and now is currently on sale in India and is up against stalwarts such as Ford Endeavour and Toyota Fortuner in the space. With breathtaking styling, luxury interiors with many first in class features and performance on par with the counterparts, the new Mahindra Alturas has opened up a new chapter in the books of luxury SUVs. Taking a glance at the outside, the car looks imposing irrespective you see it from any angle. At the front, the huge Mahindra family grille lends a bold face to the SUV and also sets it apart from the international model Rexton. The car features HID projector headlamps with daytime running LEDs and LED fog lamps, all seems flashy. The tall bonnet gives the car the required bulk it needs. And as the chin with the X theme has been kept minimalistic, the scuff plate and the lower bumper look good too. On the sides, the prominent lines with tight panel gaps give the car some muscular appeal. The car sits on 18-inch wheels with full-sized spare along with a corresponding alloy wheel. At the rear, the carmaker has given smart boot opener which closes with a nice thunk. The leaf-like taillight cluster features LED while the overall rear profile has been neatly done. Dimensionally, the car measures 4850mm in length, 1960mm in width, 1845mm in height (with roof rails) while the wheelbase and ground clearance stands at 2865mm and 180mm respectively. The luxury SUV can be availed in 5 graceful colour options including Atlantic Blue, Pearl White, Lake Side Brown, Dsat Silver and Napoli Black. The SUV can hold 70 liters of petrol in its tank while the boot space is 241 liters which can be further expanded to mammoth 641 liters by folding up the last row. The cabin of Alturas G4 exudes quality and comes loaded with a serious amount of tech and features. The interiors are embellished with dual-tone upholstery with first in class quilted Nappa leather giving a classic appeal. The car packs a lot of space and room shouldn’t be any matter of concern. The driver’s seat is not only electrically adjustable but also comes with memory settings for different individual. The same kind of memory profile storage can also be used for adjusting ORVMs as per driving preferences. The car comes with first in class ventilated seats at the front. There is enough room in the second row and a six-footer will have adequate kneeroom and headroom. The backrest in the second row can be reclined for additional comfort and also comes with 60:40 split. The car comes with tons of gadgetry including 8 inch touchscreen infotainment with Android Auto and Apple CarPlay, dual-zone climate control, auto-fold ORVM, 360 degree around view camera, automatic headlamps, automatic rain sensing wipers, engine start/stop button and electronic parking brake among others. In terms of specifications, the Mahindra Alturas G4 is powered by 2.2L turbocharged diesel engine which pumps out 181PS and 420Nm of max torque. The power is transferred via Mercedes-sourced 7-speed automatic gearbox. The car also comes with shift-on-the-fly 4WD system that makes sure the driver comes out from the tacky situations. Mahindra has left no stone unturned in the safety department. With 5-star rating, Mahindra Alturas comes equipped with 9 airbags, ABS with EBD, Brake Assist, Electronic Stability Program, Active Rollover Protection, Emergency Stop Signal, Hill Descent Control, Hill Start Assist, traction control system and ISOFIX child mount for rear seats. The new Mahindra Alturas G4 is available in two trims; the G4 4X2 AT and G4 4X4 AT. Where the 4X2 variant is tagged at Rs. 26.95 lakhs, the 4X4 version has been priced at Rs. 29.95 lakh, ex-showroom, Delhi. The car competes against the heavyweights Ford Endeavour, Toyota Fortuner and Isuzu mu-X in the segment. Open the doors and you are welcomed in the world of luxurious indulgence, cabin comfort and space. The dashboard and the doorpads use soft touch material while the seats are not only comfortable but also supportive. The ergonomics are at its best with overall touch and feel of different switched and buttons being apt. The gear knob has been finished in wood which shows that the carmaker has given detailed thought process to each and every thing. There is more to the cabin than just novelty of design and quality of materials. Jump in the front row and you are greeted with high-set comfortable post with plenty of width and headroom. People who will like to experience more comfort will want to sit on the second row instead. The car has the largest wheelbase in the competition and is relatively larger and wider than Endeavour. While many will find the second row space just average, this is because engineers have to work hard to provide more room at the third row. But there is enough room so that 3 adult passengers can sit comfortably with satisfactory headroom since the sunroof eats a lot of it. Kneeroom will also leave no reason for complains. For extra comfort, there is a deep armrest and the bench also reclines to a fair extent, giving you some moments of deep relaxation. In terms of space at the third row, there is small chance for adults and only kids 12 years and below can feel comfortable in that place. In terms of features and equipment, Mahindra has tried to add everything including the few segment firsts. The moment you unlock the car and open the door, you will see seats automatically moving back to let you get in easily. Hop on the driver’s seat and you can electrically adjust the seat in 8 different ways with three different memory profiles. And the same memory function will also remember the settings or position for the ORVMs. So, no more fiddling around the seating position every single time you get on to the driver’s position. Then there are four cameras set-up which takes this car to a whole new level. Yes, the 360 degree or bird’s eye view in conjunction with the front and rear parking sensors, will make parking maneuver easy, especially in the tight spaces. Another mind blowing feature is the ventilated seats which is something like godsend given the weather conditions here. Now comes the center highlight of the cabin i.e. the 8 inch touchscreen infotainment unit that is compatible with Android Auto and Apple CarPlay. The same unit also doubles up as the screen for displaying visuals from the rear parking camera. Moreover, you also get 7-inch TFT-LCD display resting in the middle of instrument cluster and the dials. The resolution of the 3-pod cluster is high-definition while the user interface is snappy giving you plethora of information including tyre pressure, song currently playing, digital speedometer, customized themes for the display and even change the sound of the indicators. It’s crazy man! All these information can be accessed through steering mounted controls, so you don’t have to fiddle here and there for buttons. Other usual features you would expect in a luxury SUV include push-button start, dual-zone climate control, 2nd and 3rd row ac vents, ambient lighting, foot well lighting, automatic headlamps, sunroof, smart powered tailgate, auto up/down all four windows and rain sensing wipers. The cabin also features a lot of storage spaces to place your bottles and knick knacks. The AC unit at the first row gives option of USB fast charging while there is also another USB port for charging at the second row. There are map pockets, large cup holders and an illuminated glove box. Overall, it seems Mahindra has done pretty much everything to please the elite buyers out there. Taking a glance at Mahindra Alturas G4 and you will see that it’s not over styled in any sense. The design department hasn’t gone berserk in terms of adding lines and creases here and there. But given the mammoth size, the car demands some respect. At the same time, the car doesn’t show traits of aggressiveness but oozes out the sense of strength. The design from the international spec model SsangYong Rexton has been carried forward which is a good thing. The most obvious thing at the front is the signature Mahindra grille with vertical slats which has been dipped in chrome for all the good reasons. There is a thick chrome strip that runs on the grille adding a dash of aggressiveness and premiumness to the overall front fascia. The HID projector headlights with LED daytime running lights as well as LED fog lamps, all seems to be well executed. The side profile is longer and a bit squat while the strong character lines arising from the headlights to the taillights does appears slightly overkill. Well, according to many the 18-inch wheels would be puny given the proportions of the car. The international model features 20-inch wheels but Mahindra might have thought that bigger ones are unfeasible for our ‘wonderful’ road conditions. And the extra cost of tyres would have added to the price, so Mahindra seems to have played safe here. The rear profile is peculiar with the leaf-like tail lights design seems to have lifted from Tivoli. However, the placement of model badge at the bottom is unusual and looks like an aftermarket fitment. Overall, the SUV looks attractive from most angles and has the needed road presence one would expect from such a vehicle. Mahindra hasn’t revealed the mileage figures of the car but it is estimated that the Alturas G4 can return mileage of 12-13kmpl. And given what competition is offering, the numbers seems to be satisfactory. You will have also have a good experience in city driving as the steering is light and handy. There is barely any road noise peeping inside, which is pretty impressive and adds to highways manners as well. According to the carmaker, the suspension has been made softer to tackle the Indian road conditions. Hence, ride quality is agile and the suspension manages quite well to iron out almost all the road imperfections including potholes and broken tarmac as well. However, when it comes to triple digit speeds, the car lacks that planted feel which should be in a vehicle of this stature. The car tends to bounce a bit at high speeds. Moreover, if you encounter potholes at high speeds, expect a quick reverberation from the suspension, thanks to the ladder frame chassis. And this frame chassis paired with the suspension setup creates body roll at the corners, especially when you are in the rear wheel drive mode, but behaves well when in 4WD mode. In terms of off-road driving, mostly, the car is capable of coming out of trickier situations. Under the hood, the new Mahindra Aturas G4 houses the same 2.2L diesel motor that is doing its duty in Rexton. The engine is capable of producing 181PS and 420Nm of torque and on paper, it seems par with the competition. The transmission duties are handled by Mercedes-sourced 7-speed torque converter gearbox. And as one would expect from such a car, there is shift-on-the-fly AWD system. Start the engine and you will see the engine brilliantly settling into the smooth idle state pretty quickly. And as you would expect, the clatter from diesel is negligible while the vibrations are under control unless you are revving the engine hard. So if you are one of those who are looking for a fun-to-drive vehicle, may be this is not the one you should choose. Reasons? The engine isn’t lively or being pushed too hard. If you choose to drive it anyway like that, the automatic gearbox would tend to go in a state of confusion, hesitating before downshifting and little lag when try to upshift. Sadly, there are no paddle shifters on the steering to help you out. So, the bottom line is that you should drive this car moderately and it will not disappoint you. There is plenty of power onboard and tackling the city traffic is easy. There is a smooth wave of torque coming evenly and as soon as the needle hit 1800rpm. So maintaining light foot on the accelerator will give you a smooth driving experiencing. And while you do need to acclimatize the size of the car during the drive, it’s pretty easy as the edge of the bonnet is always visible. The braking power of the car is enough and it stays stable in most situations. In terms of safety, the Mahindra Alturas G4 has been crafted using Ultra Rigid Quad Frame with High-Strength Steel and comes loaded with 9 airbags which makes it score 5-star in safety ratings in the crash test. Other crucial safety aspects include ABS with EBD, Electronic Stability Program (ESP), Brake Assist System (BAS), Active Rollover Protection (ARP), Hill Start Assist (HSA), Hill Descent Control (HDC), Traction Control System, Emergency Stop Signal (ESS), seatbelt warning for driver and co-passenger and ISOFIX Mounts for Child Seat. What is the price of Mahindra Alturas G4? On road prices of Mahindra Alturas G4 in New Delhi starts from ₹ 26.95 Lakh for base variant 4X2 AT, while the top spec variant 4X4 AT costs at ₹ 29.95 Lakh.